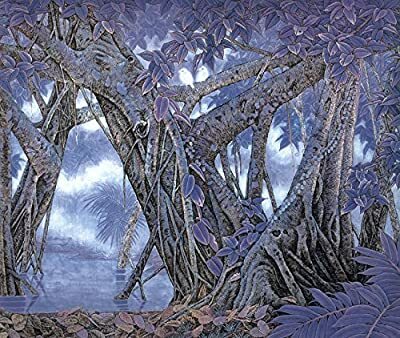 Banyan Forest Oil Painting Reprodution. Based on Famous Traditional Chinese Realistic Painting. (Unframed and Unstretched). Through the understanding of Traditional Chinese Realistic Painting ( painted on paper or silk , done with a brush dipped in ink, characterized by fine brushwork and close attention to detail) and Oil Painting, our artist has gradually formed our unique artistic style in the world - Chinese Meticulous Style Oil Painting. With the knowledge of the traditional Chinese Painting artistic conception, charm and composition, combined Oil Paining's brushwork, texture and messiness, Chinese Meticulous Oil Paintings bring us a completely refreshing feeling of the time. You can enjoy the vivid expression of famous Chinese Realistic Paintings; meanwhile have outstanding piece of artwork reproduction with oil on canvas. 100% hand-painted by individual professional artist, which shows rich color and strong stereoscopic feeling. The quality of paint pigment is stable and the color is not easy to change. Since the paintings are made by hand and are not computer generated, there is always a slight variation between the reproduction and the original and a tolerance of 0.5-1 inch in length or width. So please frame or stretch your painting after you receive it. The size indicated in the description is the painting area, and there will be a 2-4 in. margin left for you to frame or stretch. Further, the signature of the original master will be removed. You can have this painting framed in various ways but it is an easy DIY job using a premade frame from gift shops. Use plain white cardboard to mount it against, but don't use any glue as it will stain the fabric. You also could ask the owner of the shop to help you to finish the job.